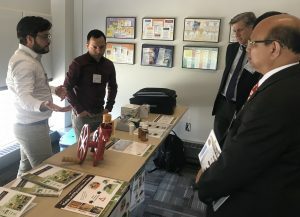 The ADM Institute recently hosted the 2018 Annual Meeting for the Feed the Future Innovation Lab for the Reduction of Post-Harvest Loss (PHLIL). 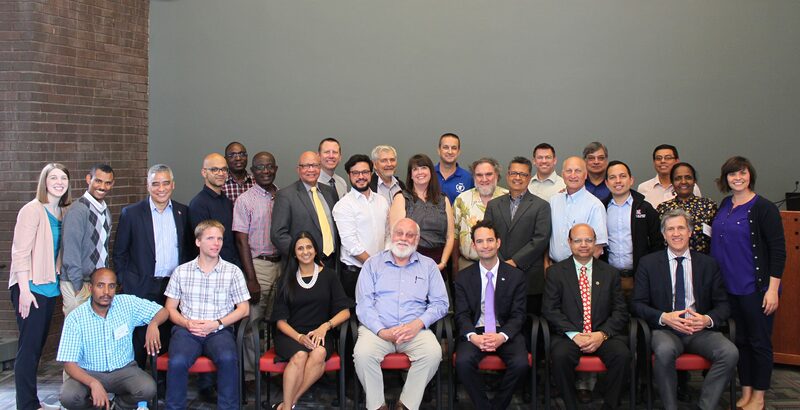 PHLIL is a USAID project based at Kansas State University; ADMI is a proud partner of the Innovation Lab. 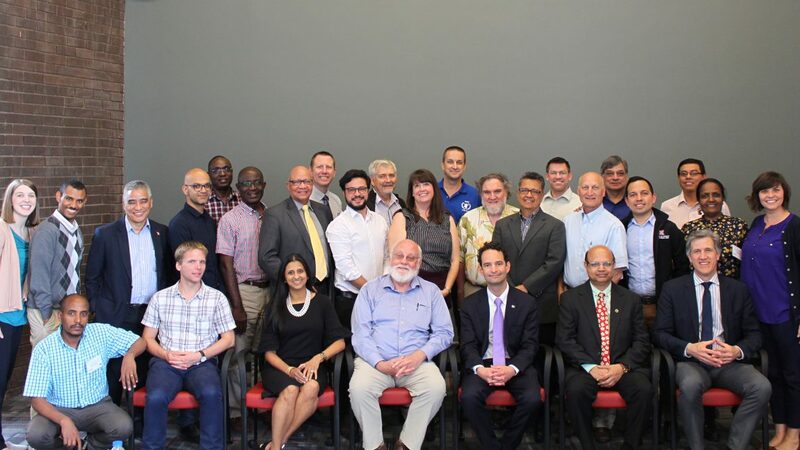 The meeting, May 1-2, 2018, brought participants from all of the PHLIL countries and programs to the University of Illinois at Urbana-Champaign. All four core countries, Bangladesh, Ghana, Ethiopia, and Guatemala, had project representatives at the meeting. Two additional PHLIL countries, Nepal and Honduras, were also represented. Beyond country representatives, the meeting roster included attendees from the University of Illinois, Kansas State University, USAID, USDA, World Food Programme, Humanitas Global, and more. Dr. Md. Monjurul Alam, Bangladesh Agricultural University, talks about his team’s work. After opening remarks from ADMI Director Dr. Alex Winter-Nelson and PHLIL Director Dr. Jagger Harvey, we heard updates from the country teams, including ADMI partner Dr. Md. Monjurul Alam from Bangladesh Agricultural University. Alam spoke about the various accomplishments over the life of the project, including research and metrics related to his team’s research on STR dryers and hermetic bags. Alam also shared how BAU is scaling up the distribution of the STR dryer by training local entrepreneurs to manufacture this essential and affordable piece of PHL technology. Dr. George Opit from Oklahoma State University, a member of the Ghana team, discussed how his team has partnered with Sesi Technologies in Ghana to locally manufacture and sell an affordable and easy-to-use moisture meter to farmers. Paul Armstrong, with the USDA Agricultural Research Service and a member of the PHLIL team, designed the moisture meter. It measures relative humidity and temperature within the grain to estimate moisture content, which are critical measurements to help prevent postharvest losses. The USDA’s AgResearch magazine featured the moisture meter on their website if you would like to read more about this PHL technology. In the afternoon of Day 1, the country teams attended sessions facilitated by Humanitas Global. These sessions were designed for participants to discuss current achievements, priorities for the rest of the year, and ideas for future years. Day 1 ended with a PHL innovation showcase. Innovations on display included SAWBO, ZeroFly storage bags from Vestergaard, and the ADMI STR Dryer. The PHLIL Guatemala team (left) demonstrates local PHL technologies during the PHL innovation showcase. On Day 2, Dr. German Bollero, Associate Dean for Research at the College of ACES, and Ahmed Kablan, Agreement Officer Representative for PHLIL, USAID Bureau for Food Security, started the day with opening remarks. The attendees then moved on to technical breakouts. Groups discussed drying, pests and pesticides, mycotoxins, and storage. I attended the storage breakout. In this session, ADMI partner John Hart spoke about our work on developing a remote text-based moisture monitoring system. Brett Rierson, head of the World Food Programme Global Post-Harvest Knowledge & Operations Center, discussed their efforts in Uganda, including the development of small, stackable grain storage bins that can be locked and stored inside the home. In the afternoon, attendees participated in a workshop presented by Maria Jones and Katy Mosiman from AgReach. We participated in an exercise to help us better understand ways in which to integrate gender and nutrition into postharvest research and outreach efforts. Joe Miller from AgReach spoke about methods to engage youth in postharvest and agricultural market systems. The meeting ended with a group discussion about priorities for the remainder of 2018 and possibilities for future work. ADMI enjoyed hosting such an engaging and important meeting. So many more ideas were shared and discussed beyond what I can include in a blog post! To see all of the presentations, please visit the PHLIL annual meeting website. 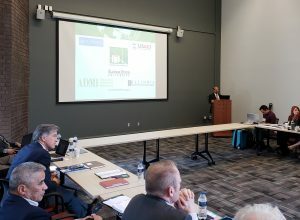 Thank you to all of the attendees for your time, energy, and efforts on postharvest loss prevention, and we look forward to future PHL collaborations.